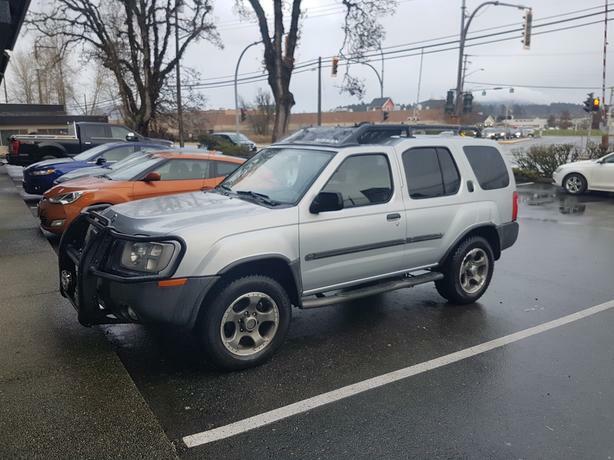 2002 Nissan Xterra SE. Supercharged 3.3l with 5spd manual, 282km. Silver with black interior, bluetooth stereo, AC, PS, cruise control, PW, PM, sun roof, cargo basket on roof rack, rubber trunk liner, bush bumper, 17" rims with good tires w/ full size matching spare. Spark plugs, cables, cap, rotor, coil, water pump and timing belt all have another 50k left in them. New intake/supercharger gaskets and coolant in the last 2000km. The clutch looked as new. Runs and drive excellant, 4x4 works great, small dent on drive side rear wheel well other wise body and interior are in great shape.